Priddy Folk Festival is proudly a “not for profits” organisation run by volunteers with the stated aims of promoting music and arts and improving the environs of Priddy. It is a major contributor to the local school and preschool, without it’s critical funding these two imperative village facilities would find it difficult to operate. In 2012 with some new ideas working with the local Wells Blue School, and Halsway Manor focused on promoting young musicians in the folk tradition. This was a great success and so popular that we have carried it on in the free concert on Saturday mornings. 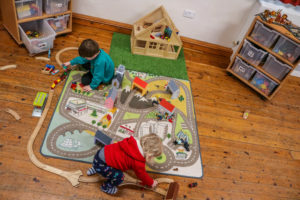 Halsway Manor has provided a home for people to enjoy, explore and learn about traditional music, song, dance, craft and more, since it was established as England’s National Centre for Folk Arts in 1965. 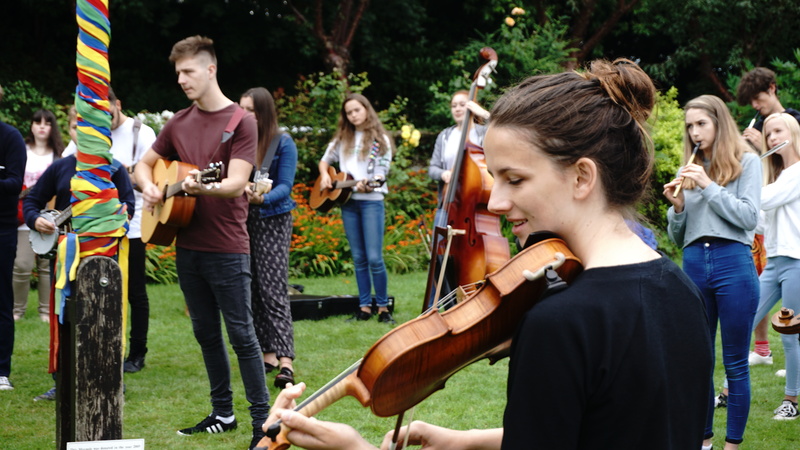 More recently it has developed a thriving programme of residential courses for you ng people to discover their folk roots, develop their music and performance skills, and make lasting friendships too! Funds raised by Priddy Festival have provided bursaries to support young people who might not otherwise be able to benefit from this opportunity! Currently four courses are offer through the year: Juniors for ages 8 – 12 (Tue 21 – Thu 23 Aug 2018), Intro for ages 12 – 16 (Mon 2 – Fri 6 April 2018), Intermediate for ages 13-18 (Mon 30 July – Sat 4 Aug 2018, culminating in performances at Sidmouth Folk Week) and Advanced for ages 16+ (Mon 20 – Fri 24 Aug 2018). The creative team this year includes Will Lang, Claire Bailey (Pastoral Lead), Niopha Keegan (The Unthanks) Ford Collier (The Drystones), Archie Churchill-Moss (Moore Moss Rutter), Sam Kelly (Sam Kelly & the Lost Boys), Nicola Lyons (4Square). For more information on all of Halsway’s Young Folk courses visit www.halswaymanor.org.uk. Priddy parish contains a wealth of archaeological sites ranging from earlier prehistory to the 20th century, including nationally and internationally important funerary and ritual sites, settlements, agricultural structures and the remains of extractive activities. However, our understanding of the typology, development and chronology of these sites, the relationships between them and their associated material culture is poor, limited by the lack of modern excavation. As a result, many of the archaeological sites are of uncertain date and function, making it difficult to generate interpretations. These interpretations are not only of academic value but can also be used to enhance community engagement with their local heritage and aid management and conservation strategies. I have been researching the archaeological landscape of Priddy since 1995 and have been leading the popular archaeological guided walks at the Festival since 2001. I carry out annual research excavations on the Mendip Hills and for the last six years these have been in Priddy. The sites I have investigated range in date from the Neolithic to the Post-Medieval and are providing vital new insights into the origins and development of Priddy parish, from the prehistoric period to the present day. The funding I have received from the Folk Festival has been invaluable. The funds have contributed to the costs of post-excavation analyses including radiocarbon dating, palaeoenvironmental studies and artefact illustration. These are essential – but expensive – specialist archaeological services and without this funding, my research would be impossible. Priddy is the only village on the high Mendip plateau and since the end of the last Ice Age, communities have settled here and recognised this as a very special place. My archaeological research is revealing how these successive communities played a part in shaping the landscape we experience and cherish today. 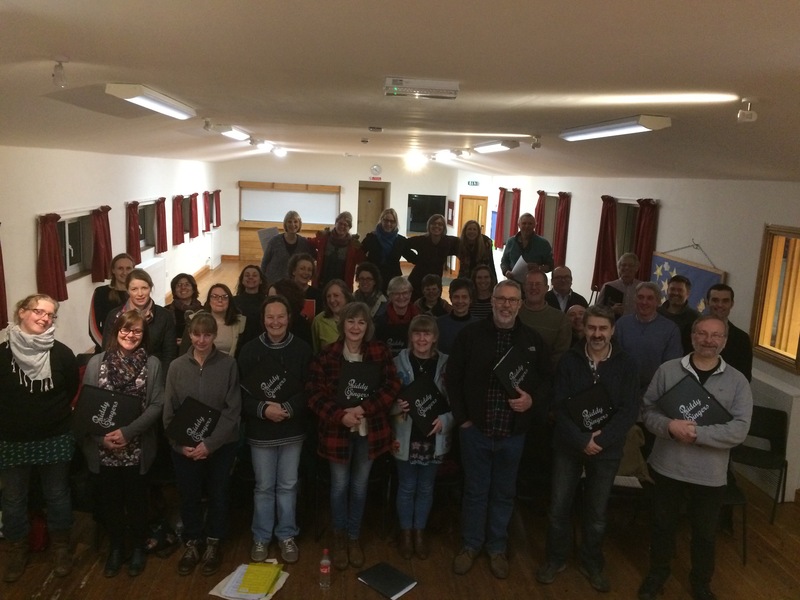 The Priddy Singers was founded in November 2015 and with the generous support of the Priddy Folk Festival has quickly established itself as a popular and friendly community choir, performing to a high standard. Financial assistance from the Priddy Folk festival has been crucial in helping us to grow quickly from a fledgling group to the 40+ members we now comprise and the choir is proud to be able to offer the first half term of singing free of charge to all new members, putting an outward-looking and welcoming philosophy at our core. Funding from the Priddy Folk Festival has also allowed us to purchase branded folders for all singers and to purchase copies of copyrighted repertoire. This helps us in broadening our repertoire and raising the musical standards of the gro up by selecting songs which are ‘just right’ for us rather than simply those which are freely available to photocopy. The range in our repertoire is a major attraction for our members and meshes together this diverse group of singers – some with no previous singing experience, some with a strong background of classical singing and some with a passion for 80s classics! Priddy Folk Festival funding has enabled us to pay a piano accompanist to play for some rehearsals and performances. As the choir grows and the songs become more complicated, this support for our professional musical director (who would otherwise play for her own rehearsals) becomes crucial. 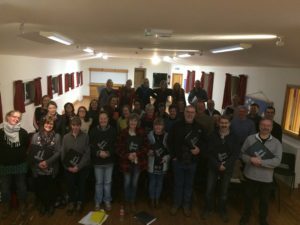 The Priddy Singers is already well-known in the community and had a sell-out Christmas Concert in Priddy Village Hall last year. It is a regular participator in the Priddy Church Carol Service, performs an annual summer concert in Westbury Village Hall and -the annual highlight!- features at the Priddy Folk Festival. We have collaborated with the school choir of Priddy and St Lawrence’s, have performed with ceilidh band Squeeze, Fiddle, Pluck and have helped with fundraising for the Priddy Preschool. This summer we aim to assemble100 local singers of all ages to raise the (marquee) roof in the finale of our set at the Priddy Folk Festival. A great success story over the 40 months we have existed so far, the Priddy Singers is very grateful for the support of the Priddy Folk Festival, which has been key in making this possible. marketing materials to promote the setting and attract new children. Priddy Pre-school is extremely grateful to the Folk Festival for their on-going support and for enabling the children of Priddy to benefit from an enhanced musical dimension to their education. Thanks to the support of the Folk Festival Priddy School children have had the amazing opportunity to sing during the festival which definitely brings a tear to most parents eyes! I am replying on behalf of St Lawrence Church, who are immensely grateful for the generous donations the Folk Festival (FF) have given us.